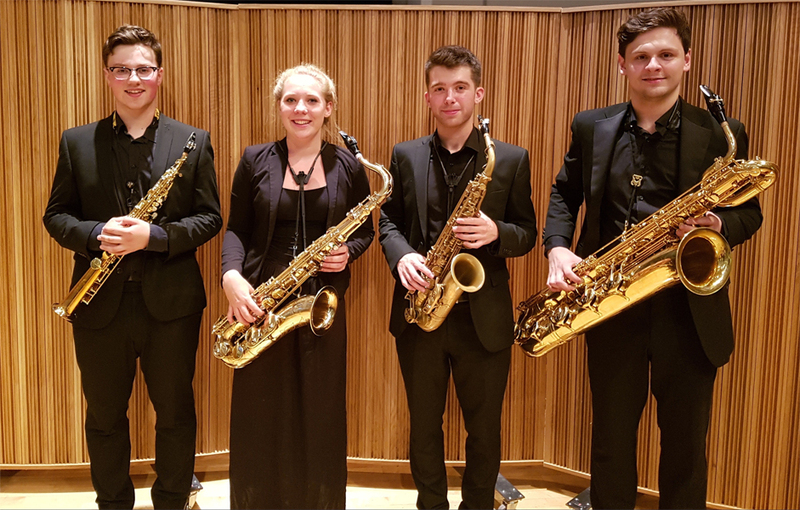 The London based Aesthesia saxophone quartet is an award-winning chamber ensemble from the Royal College of Music, studying under Kyle Horch. Despite having only recently formed in September 2016, the members (Jonathan Vaux, Daniel Scott, Stephanie Frankland and Ashley Brand) have developed a strong affinity with one another, and this is apparent through their communicative approach to performance. At the 2017 Nordic Saxophone Festival in Aarhus, Denmark, the Aesthesia Quartet performed in a masterclass with Evgeni Novikov, following which they were asked to also give an evening recital. Closer to home, they were given the opportunity to play in a masterclass led by Melanie Henry. Recently, the group were awarded the June Emerson Launchpad prize in the Royal College of Music’s Woodwind Chamber Competition and are supported by Talent Unlimited. Jonathan won the Under 18 woodwind category of the Harrogate Music Festival, and became overall champion in 2015. He is now studying at the Royal College of Music as a Scholar supported by The Henry Wood Accommodation Trust and a Hedley Trust Award. He also reached the woodwind semi-finals of the BBC Young Musician of the Year in two consecutive competitions. As a soloist, he has played in a number of concerts, including a solo recital at the Harrogate International Festival. He has played in Masterclasses lead by Jonathan Helton, Rob Buckland, Nikita Zimin and Jeffrey Wilson. Jonathan was a member of the Yorkshire Saxophone Choir who played at the 2015 World Saxophone Congress alongside with some of the world’s greatest saxophonists and has been a member of both the National Children’s Wind Orchestra and the National Youth Wind Ensemble. Daniel Scott is winner of Gregynog Young Woodwind Player of the Year 2015 and is studying as a Royal College of Music Scholar supported by a Douglas and Hilda Simmonds Award. He is also a recipient of an EMI Music Sound Foundation Award and is generously supported by Talent Unlimited. Daniel began playing saxophone only five years ago but despite this has gone on to achieve a great many things, and has a keen interest in both classical and jazz saxophone. He has played in a masterclass with Rob Buckland and performed with renowned accompanist Catherine Milledge, as well as having worked with Amy Dickson on her album ‘Glass’ on the Sony Classical label and on BBC Radio 3’s In Tune programme. Stephanie Frankland studies at the Royal College of Music. She has played the clarinet and saxophone with the National Youth Orchestra of Great Britain for three years, working with internationally renowned conductors including Glenn D Price, Matthew George and James Gourlay and soloists including leading percussionist Simone Robello. Whilst studying at St Peters School in York, she led a clarinet choir, performing in venues including York Minster and Santa Maria in Blanes, Barcelona. In her final year at the school, Stephanie was a part of the swing band helping lead its way to two platinum awards in the National Concert Band Festival, being placed as one of the top two school wind bands in the country. She has competed in many competitions, including the Rotary Young Musician of the Year, East Coast Young Musician of the Year, and the BBC Young Musician of the Year. Stephanie won her school Senior Music Festival in her first year of sixth form and in the same period attended the York Arts Academy Jazz Orchestra who released a CD in November entitled Soundwaves. 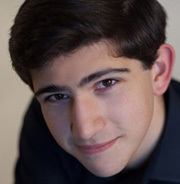 Ashley Brand is a saxophonist and clarinetist currently studying at the Royal College of Music under Kyle Horch. Previously, Brand attended Bancroft's School (2008-2015), where he had been awarded a sixth-form music scholarship and the Pusey Music Prize for his outstanding musical contributions to the school. During his gap year (2015-2016) Brand earned the ABRSM Diploma for Music Performance and made his first competition appearance at the Stratford and East London Music Festival, placing first in the Senior Woodwind category.